If you’re a Central Illinois driver looking longingly at the 2016 Chevy Cruze mpg ratings, we want to make sure you know about the Cruze’s competitors. While the small car world is fierce, perhaps the most competitive model in the class is the 2016 Honda Civic. 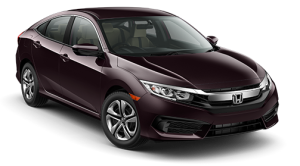 Available now at a Central Illinois Honda Dealer near you, the new Civic sedan has one of two different engine options, both of which deliver more power and a better fuel economy than the Chevy Cruze. It sounds too good to be true, doesn’t it? Read on to see the specs for yourself. Each 2016 Chevy Cruze earns 36 mpg highway and 25 mpg city for 29 mpg combined—that’s on their basic L trim level with a manual transmission. The 2016 Cruze only manages 138 hp and 125 lb-ft of torque, which would be enough to compete with a subcompact like the Honda Fit. The 2016 Civic LX’s 2.0L 4-cylinder is rated at 158 hp and 138 lb-ft of torque. Upgrading to the new turbocharged engine brings the power of the Civic up to 173 hp and 162 lb-ft of torque. We’ve only just looked at the differences in the engines between the Civic and the Cruze; there is so much more that we can compare for you. Visit a Central Illinois Honda Dealer near you today and take a test drive of the Civic to see it in action for yourself.